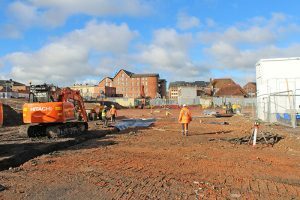 The last of the excavations associated with the redevelopment of the Barbican Car Park in Gloucester have now been completed. This involved the excavation of two inspection chambers in Commercial Road, immediately outside of the site, and in close proximity to the alignment of the former Roman and medieval town wall and ramparts. 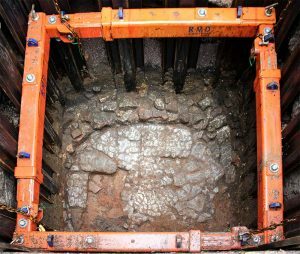 The first inspection chamber, approximately 5m², was excavated to about 1.8m below the modern road surface, where we identified a circular stone structure, approximately 2m in diameter, with a flagstone floor sealed by remnants of Opus Signinum, a form of Roman concrete. The structure was cut into the earliest phase of rampart material associated with the Roman defences, and subsequently had been demolished to floor level and sealed by the second or third phase of rampart material, associated with the later 2nd to 3rd-century remodelling of the Roman civic defences. 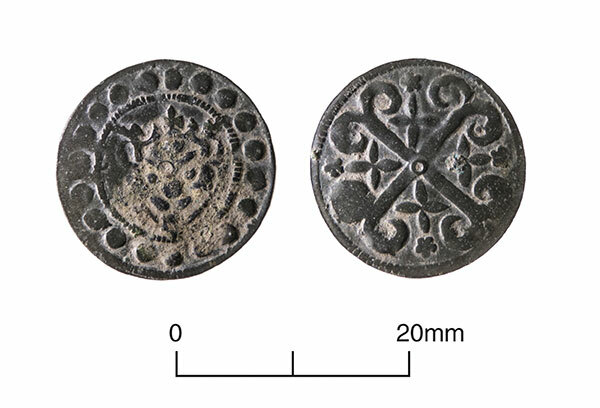 This suggests an early date for the circular structure and it was probably contemporary with the legionary fortress becoming a colonia, or retirement town for Roman army veterans, in the AD 90s. 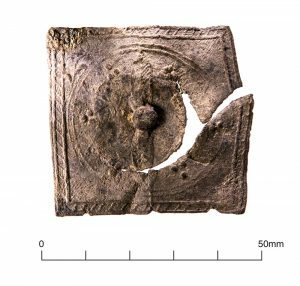 The form of the structure, and the use of Opus Signinum, perhaps to try to waterproof it, suggests that it may have been a cold plunge bath, possibly associated with a bath-house complex. 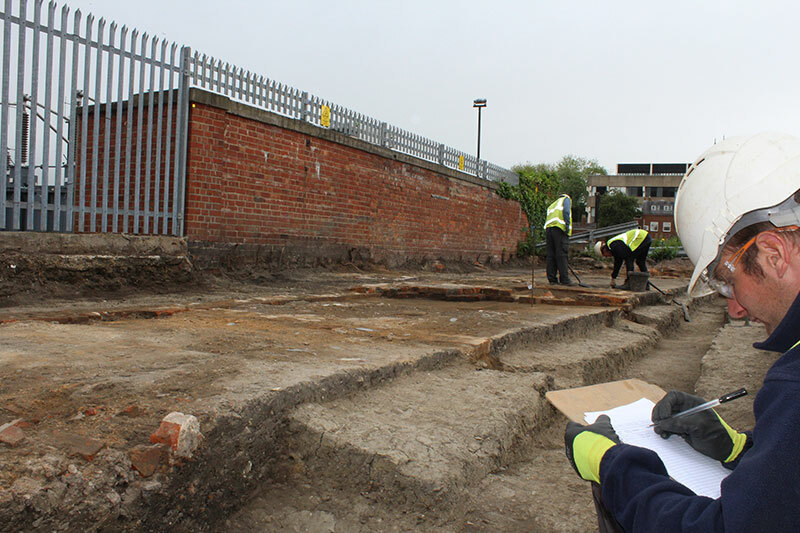 Evidence for buildings cutting the rampart has been identified previously along Commercial Road and along the eastern defences. Fortunately it has been possible to preserve these important remains in situ by moving the inspection chamber to a new location. Excavations at the new chamber location identified further evidence of the Roman rampart as well as medieval robbing of the town wall. 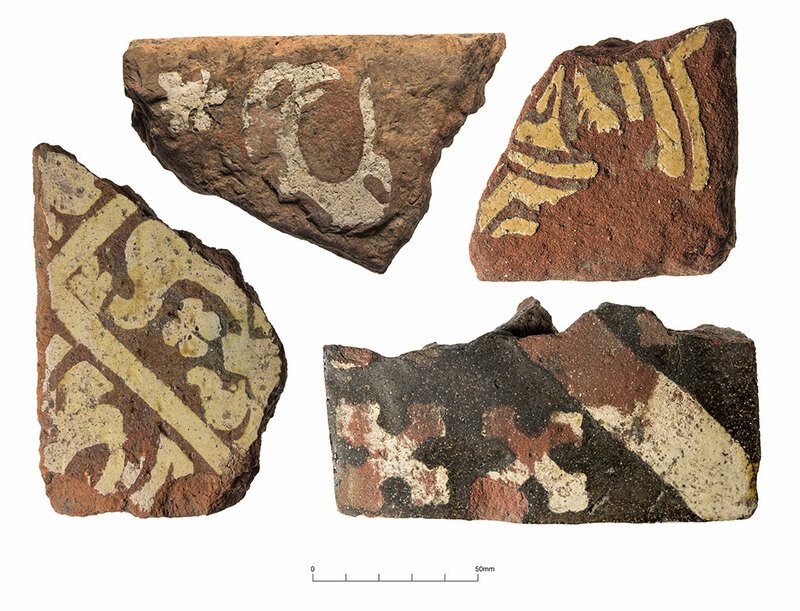 Medieval decorated floor tile was recovered from the robber trench, suggesting an association with the dissolution of the nearby Gloucester Blackfriars in the 16th century. 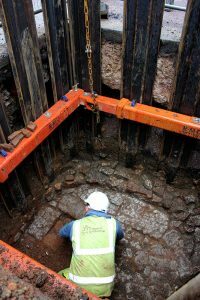 Investigations in advance of the redevelopment of the Barbican Car Park in Gloucester have identified Roman and medieval remains between 1m and 2m below the former car park surface. 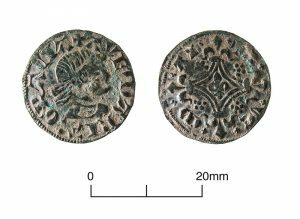 These include the remains of the Roman defensive town wall, Roman buildings and houses, Anglo-Saxon and medieval deposits, elements of the Norman motte-and-bailey castle, and ditches from the later 12th-century castle. 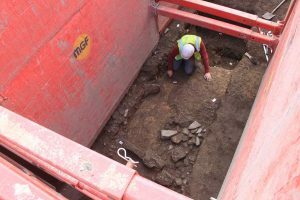 The new development, which is being undertaken on behalf of the University of Gloucestershire, has been designed to avoid damaging the underlying archaeology by raising the ground levels prior to building works commencing. 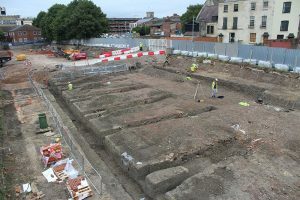 Where this hasn’t been possible, archaeologists from Cotswold Archaeology have been undertaking a series of archaeological excavations, in particular at the Barbican Car Park at the junction of Commercial Road and Ladybellegate Street, and also close to Barbican Way. 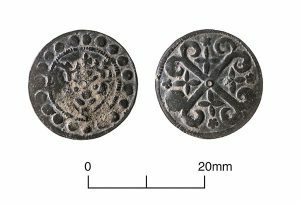 The earliest features identified during these excavations are a series of pits that were probably contemporary with the Norman motte-and-bailey castle, sealed by a capping layer of thick clay. 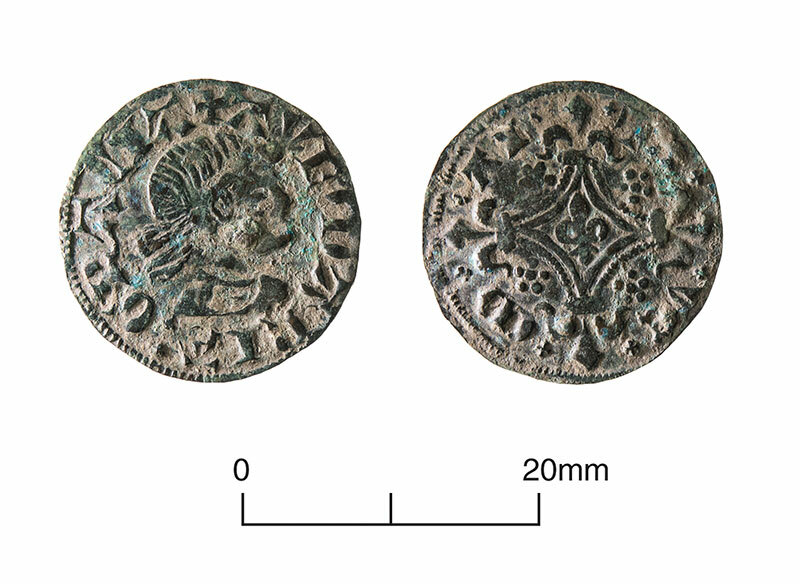 A similar clay deposit has been identified previously across the Barbican area of the city, and in particular beneath the Gloucester Blackfriars immediately to the south-east of the site, suggesting it was laid down for the construction of the Blackfriars precinct in the mid 13th century. 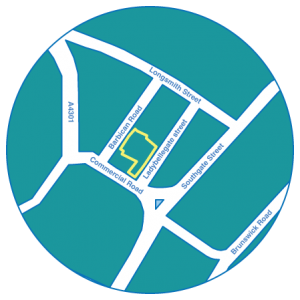 Subsequent medieval and post-medieval activity was heavily truncated during the construction of later buildings along Ladybellegate Street and Commercial Road in the 19th and 20th centuries. However, a series of pits next to Ladybellegate Street contained artefacts associated with the dissolution of the Blackfriars and its transformation into Thomas Bell’s mansion in the mid 16th-century, or (more likely) with the subsequent 18th-century alterations to Bell’s mansion house. 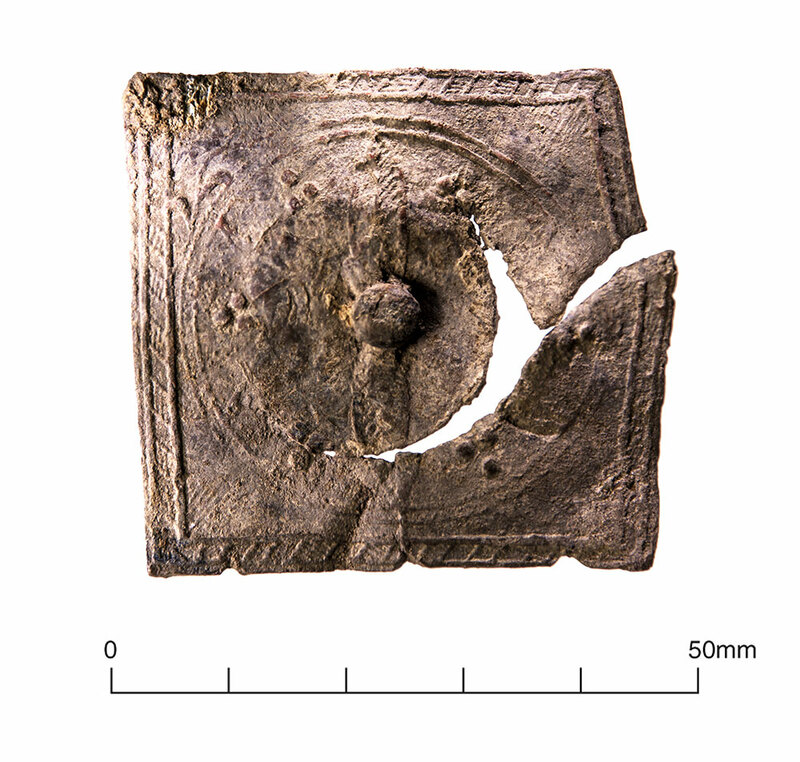 Medieval floor tiles, lead window came, medieval jettons and strap ends were recovered from these pits, along with clay tobacco pipes. 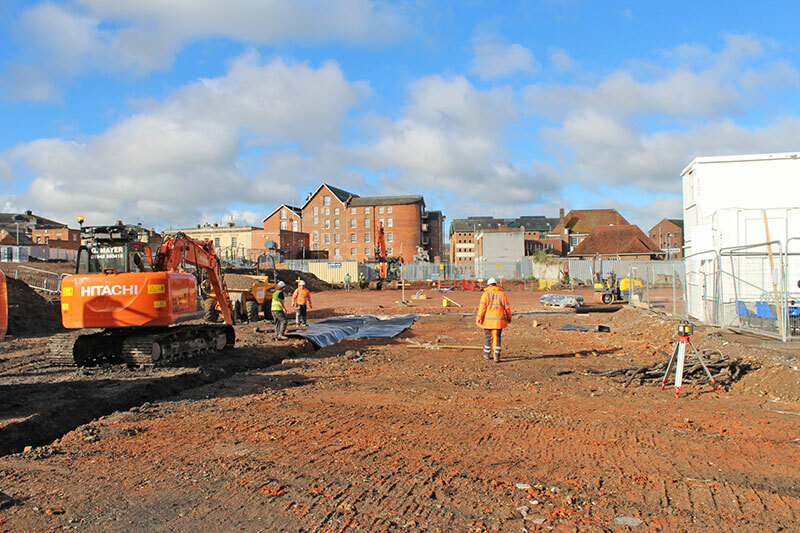 Archaeologists will remain on site during the course of the development to investigate and record any remains that may be discovered as building works progress.